Iconic model train company Lionel wanted to attract a new generation of train enthusiasts while still appealing to niche hobbyists and collectors. Iconic model train company Lionel has been manufacturing and selling trains for more than 100 years. The company wanted to attract a new generation of train enthusiasts while still appealing to niche hobbyists and collectors. 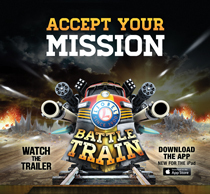 The company released Battle Train, a gaming application for the iPad. Shift Communications helped to launch the app and drive brand awareness through social media relations. "Lionel is an iconic brand that has a loyal fan base, but how do you acknowledge them and grow your tech-smart generation?" says Alan Marcus, SVP at Shift. The agency unified branding across all of Lionel's social channels to create a consistent look and feel. Facebook, Pinterest, Instagram, and Twitter were all leveraged to build buzz prior to Battle Train's launch, including sneak previews of the app, blogs, and videos. Lionel also leveraged trending topics such as throwback Thursday (#TBT) and popular conversations among train hobbyists. The brand highlighted the history of its trains as educational resources to new followers and promoted positive Battle Train reviews and coverage. Giveaways were conducted on social channels and Shift pitched to video game, technology, and pop media outlets. Battle Train had 110,000 downloads as of March and was listed as one of the top 25 Free Apps for iPads within a week of launching. Lionel's Facebook following grew from 8,577 to 16,655 in four months, and has since grown to about 40,000. The company garnered coverage in outlets such as Polygon, AllThingsD, and IGN. Tony Bordon, Lionel's strategy consultant, says, "An extensive and diverse relationship network has brought our brand and products valuable equity this past year." The agency supported Lionel's exhibition at Toy Fair in February in New York and launched LionelTracks.com, a site that celebrates locomotion.